Zen Master, poet, peace and human rights activist, Thich Nhat Hanh was born in central Vietnam in 1926 and joined the monkhood at the age of 16. In Saigon in the early 1960s, he founded the School of Youth for Social Services (SYSS), a grass roots relief organization that rebuilt bombed villages, set up schools and medical centers, resettled homeless families, and organized agricultural cooperatives. Rallying some 10,000 student volunteers, the SYSS based its work on the Buddhist principles of non-violence and compassionate action. 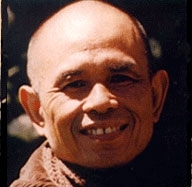 Despite government denunciation of his activity, Nhat Hanh also founded a Buddhist University, a publishing house, and an influential peace activist magazine in Vietnam. Exiled from Vietnam, he traveled to the U.S. where he made the case for peace to federal and Pentagon officials including Robert McNamara. He may have changed the course of U.S. history when he persuaded Martin Luther King, Jr. to oppose the Vietnam War publicly, and so helped galvanize the peace movement. The following year, King nominated him for the Nobel Peace Prize (nomination letter). Subsequently Nhat Hanh led the Buddhist delegation to the Paris Peace Talks. 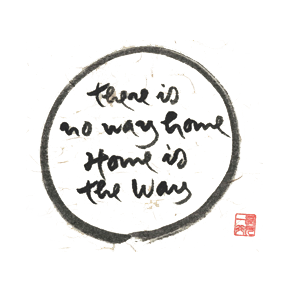 Often referred to as the most beloved Buddhist teacher in the West, Thich Nhat Hanh’s teachings and practices appeal to people from various religious, spiritual, and political backgrounds. Nhat Hanh offers a practice of “mindfulness” that is beneficial for people of all faiths, by helping us resist and transform the speed and violence of our modern society. His life and teachings have deeply influenced millions of people, including scores of luminaries in different fields: politician Jerry Brown, civil rights champion Martin Luther King, Jr., eco-activist Joanna Macy, and Catholic mystic Thomas Merton, to name a few. He has published more than 100 titles, including more than 40 in English: Peace is Every Step, Being Peace, Touching Peace and many more. His books are published by Parallax Press . Text courtesy of The Community of Mindful Living.